A recent discovery in the laboratories of Tel Aviv University has revealed ancient Hebrew words hiding on an already famous piece of pottery, the university announced last month in a story picked up by media worldwide. Kudos to the scientists who brought those words to light, using multispectral image acquisition. Or, to quote that ancient sherd’s writer – greetings to their households and blessings on them. Arad ostracon no. 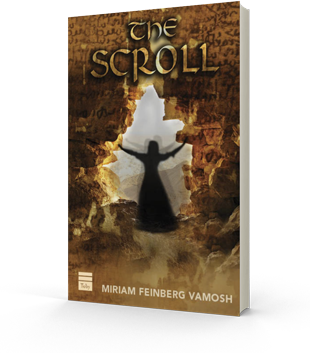 16 with the new lines of text newly discovered by a Tel Aviv University team. Courtesy of Tel Aviv University. 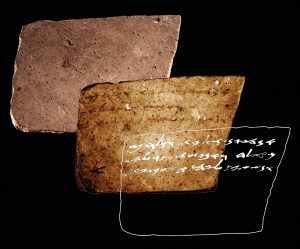 The newly discovered words – about 17 of them – were found on a potsherd, part of a group known as the Elyashiv ostraca, discovered 50 years ago in the Negev desert fortress of Arad and inked some 2,600 years ago. The article announcing the discovery, published last month in the journal PLoS 1, says the revelation shows how important it is to thoroughly document such finds with the advanced technique the team used, rather than a standard digital camera or even by infrared. They are so fragile, and we may not always have them with us. Soon I’ll ask you to don your mind’s multispectral lens to read between the lines, too. But first, a little about what the sherd is and what we now know it says. Known to scholars as sherd no. 16, it’s one of over 100 Hebrew inscriptions, written during the sixth-century BCE Babylonian siege of Judah, which included the city of Arad where it was found a half-century ago. A name they mention more than once is Elyashiv, commander or quartermaster of the Arad fortress; they mostly bear instructions from his superiors to supply grain, wine, oil and even military reinforcements. 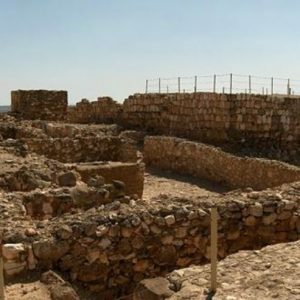 Tel Arad, view of the ruins. Courtesy of the Israel Ministry of Tourism www.goisrael.com. According to the Tel Aviv University research team, the three new lines, found on the back of the sherd, were written to Elyashiv from one Hananyahu, asking about wine, oil and silver (money), offering to send anything Elyashiv needs, and mentioning a measure of sparkling (!) wine transported by a man named Ge’aliyahu. Scholars say the sherds were written just before the destruction of Judah and the Jerusalem Temple by the Babylonians – during one of Nebuchadnezzar’s incursions, possibly in 598 BCE or 587 BCE, or as late as the time of the Temple’s destruction a decade later. 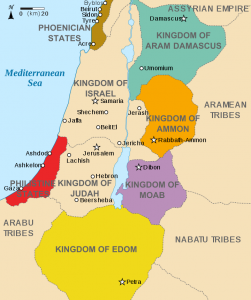 Boundaries of biblical kingdoms in the Holy Land. Wikipedia. It’s believed that Psalm 137 was written right after Judah’s destruction by the Babylonians, an event in which scholars tell us the Edomites took part, possibly even destroying Arad itself. The Edomites then occupied Judah, and the region to the south eventually became what the Romans called Idumaea, from the word Edom. The Edomites and the Israelites were closely related through their ancestors, twin brothers Jacob and Esau – Esau became Edom and Jacob became Israel. And as it turns out they despised each other even before the famous mess-of-pottage and birthright fiasco – right back in Rebekkah’s womb. Because of their relationship, the Israelites were forbidden to hate the Edomites (Deut. 23:7). You wouldn’t know it, though, with all the furious and vengeful verses the Bible flings at them (among them Psalms 60:8 and 108:9, Obadiah 1:1–16; Ezek 35:15). And Edom gave Israel plenty of cause over the centuries (Num. 20:17, 2 Chron. 28:17, 2 Kings 24:2). But there’s nothing worse than a feuding family; we need the Bible for many things, but not to tell us that. Eventually “Edom” morphed into the most convenient name for “the enemy,” back in the day, whether Romans or ancient Christianity. The Arad sherds are a treasure trove to scholars for many reasons. And now, the recent study’s highlighting of sherd no. 16 can lead back to consideration of the names it bears, known from before and particularly significant because of their Hebrew meanings: Hananyahu (“God grant mercy”), Elyashiv (“God restore”), Azaryahu (“God help”), (Ge’alyahu “God redeem”). All soldiers or servants of soldiers. All no doubt hoping someday to go home to their families. In “Tourists,” the Israeli poet Yehuda Amichai urges us to think of modern-day Jerusalemites when we marvel at the antiquities among which they live. Let’s take his advice and ponder the ancients behind the stones as well. This landscape is so thickly littered with remnants of the past. The builders of the ramparts, fortresses, palaces and temples, and their destroyers, are all ghosts now. Specters, now brought alive by multispectral screening. Unfortunately, there’s no cutting-edge technology to screen our souls to find something ghost-written there, other than the enmity in which we so stubbornly persist, for others and even for our own. If there were, that right there might be our mercy, our restoration, our help, our redemption. And our Independence Day as well. Yohanan Aharoni. Three Hebrew Ostraca from Arad. Bulletin of the American Schools of Oriental Research No. 197, Feb.; 1970, pp. 16–42. 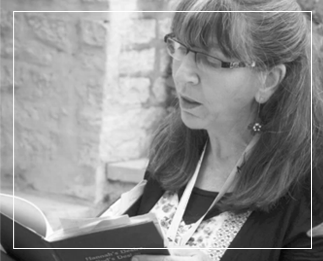 Elie Assis, Why Edom? On hostilility towards Jacob’s brother in Prophetic Sources, Vetus Testamentum Vol. 56, Fasc. 1 (Jan., 2006), pp. 1–20. Shira Faigenbaum-Golovin Anat Mendel-Geberovich, Arie Shaus, Barak Sober, Michael Cordonsky, David Levin, Murray Moinester, Benjamin Sass, Eli Turkel, Eli Piasetzky Israel Finkelstein. Multispectral imaging reveals biblical-period inscription unnoticed for half a century, http://journals.plos.org/plosone/article?id=10.1371/journal.pone.0178400. Heschel, Abraham Joshua, The Prophets, Vol. 1. New York: Harper Colophon, 1962. Schuster, Ruth, Inscription Found on First Temple-era Pottery in Jerusalem, Ruth Schuster, Haaretz English Edition, http://www.haaretz.com/1.796024. Fascinating and well done! I love this stuff. Thank you Gary! Love your website!